Last Updated: March 19, 2019 · Published: April 23, 2018 By: Asian Caucasian 4 Comments This post may contain affiliate links or sponsored content. Next, create a lettuce bowl layered with fresh veggies like carrots, radishes, tomatoes, cucumbers, edamame pods, and radish sprouts. Or, create your own salad toppings, this dish is incredibly versatile. Top the veggies with grilled miso shrimp and homemade miso dressing. 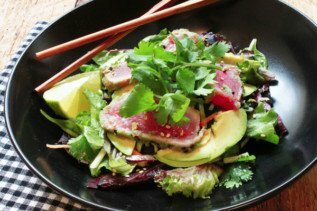 Garnish with sesame seeds and, voilà, a healthy, nutritious salad for the entire family! 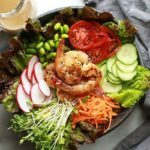 This gorgeous Miso Grilled Shrimp Garden Salad is so fresh and perfect for a spring or summer salad entree! 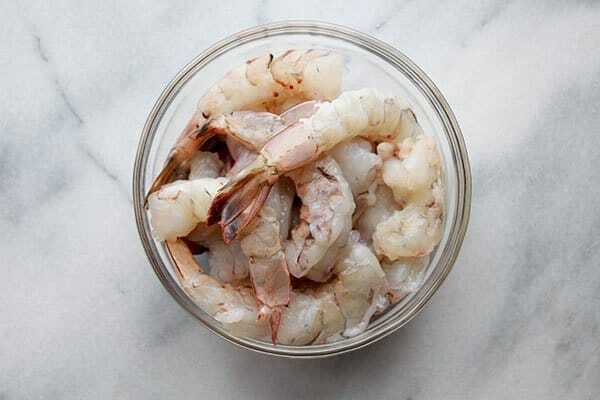 Use fresh large shrimp that’s been peeled, but tail-on. It makes a nicer presentation! The miso marinade is full of incredible flavor for grilling the shrimp. The aromas in your house will smell amazing! 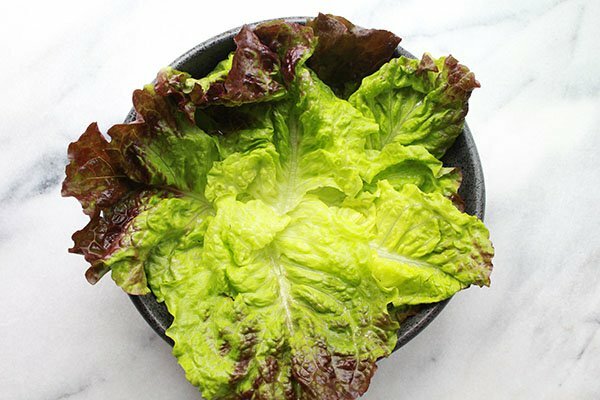 Start with a base of lettuce leaves or mixed lettuces. Then start layering with the fresh veggies! 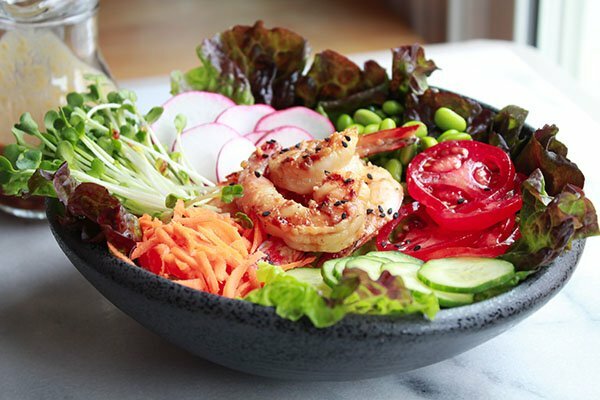 This Grilled Miso Shrimp Garden Salad is so colorful and full of flavor. You’ll love the miso dressing that goes on top! In a small bowl, whisk together miso paste, lemon juice, sugar, pepper, garlic, ginger and canola oil. Add the shrimp and toss to coat. Marinate 5 to 10 minutes. Preheat a grill pan over medium-high heat. 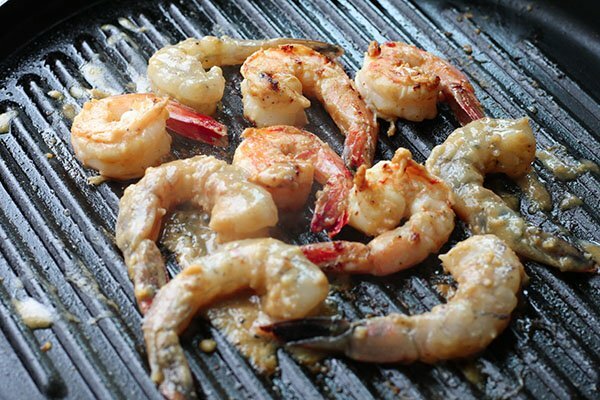 Grill the shrimp 2 to 3 minutes on each side until shrimp is slightly charred and curled and pink. Do not overcook! Remove shrimp from pan and set aside. 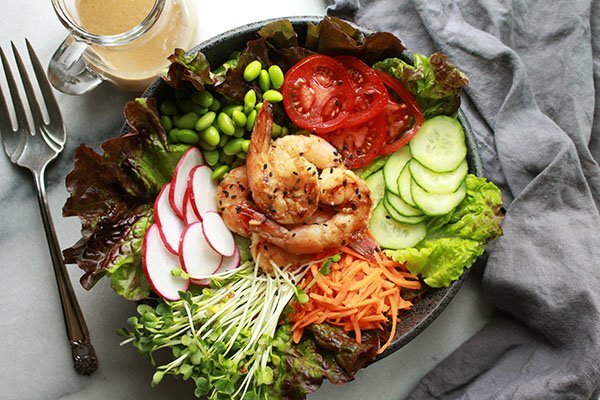 Assemble the salad: Layer each salad bowl with lettuce leaves or mixed greens, radishes, shredded carrots, radish sprouts, sliced cucumbers, sliced tomatoes, edamame pods, and the grilled miso shrimp. Top with the miso dressing and sprinkle with black sesame seeds. All those veggies have me drooling! So much flavor too! The flavor of the shrimp, and the miso dressing are so delightful! Such an easy salad to prepare for the whole family! I’ve been looking for a new salad to try, and I think this is it!! Thanks for sharing!!! I’m so glad you’re going to try this one. It’s just so colorful, healthy, and delicious!